I hope the title provokes you enough to keep reading. I don't know where to even begin, but we all have to start somewhere, right? For some time now, I've had this tug on my heartstrings to go "back to work," some how, some way, some day. And although I'm not clear on "what" I need to do, I know it's something different than my career before kids. I feel like there is something else God is calling me to do. Lately, that tug has become more of a persistent and strong pull that works it's way into every facet of my life. Have you ever had a tug like that? I came across this article featured on The Huffington Post, "How Being a Stay-at-Home Mom Landed Me My Dream Job," by Stephanie Giese (click the link to read the full story). I was inspired by the possibility that my experiences as a full-time mom might, in some way, be valuable to the rest of the working world. And, I was intrigued at the prospects of finding a balance in my life between my family and the "working mom's Kool Aid." That's where I am today. It's a little scary because it's so much easier said than done. I am a teacher and psychology major by the likes of my college degree. I have been a stay-at-home mom for seven years now. At first, it's hard to believe I've been out of the "workforce" for that long. I never imagined I would or could stay home for this long. And, I certainly had no idea that getting out of the "workforce" would prove to be the most challenging and rewarding job in the world for me. Time really flies when you're busy putting your heart and soul into managing your growing family, regardless of your job status. Now, on the other hand, as I begin the process of updating my resume, it is ridiculously clear to me that seven years as a stay-at-home mom is an eternity to the the working world. Just a little net surfing and I found myself riding the waves of resume power words, on-line networking, and creative personal branding statements. Go figure. 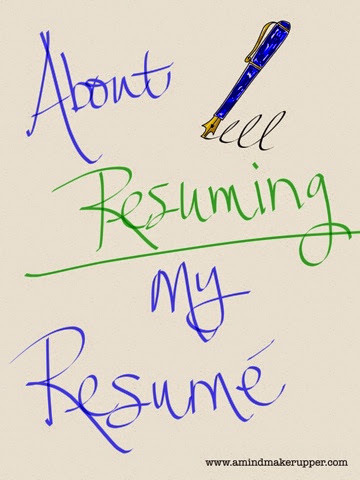 What started out as a plan to update my resume is turning into a blog post. I did a Google search on resume trends for stay-at-home moms, and I came across some harsh reality. Here's just one snapshot from an article that was featured on Forbes.com. And while no one is going to argue that your job is among the hardest on the planet, your “at home” time can present serious challenges as you prepare to venture back into the 9-to-5 workforce. How the heck do you market yourself when you’ve not held a “real job” for several years? How do you hide the gaps in your career chronology? How do you convince a corporate employer that, in spite of your hiatus, you’re excited and ready to work—and that you’re the ideal candidate for that position? Unfortunately, I think this article is a decent reflection of the unspoken perception of stay-at-home parenting. It's challenging and important, but not transferable to the working world. And so, here I sit facing one of my biggest fears. It seems that the most important and accomplished work experience in my life is not very resume appropriate. It's a shame really. Why? I mean, why is it that we don't consider being a full-time mom or dad a "real job?" Why does making the choice to raise your children full-time mean sacrificing your career chronology? Why is being a stay-at-home parent a disadvantage that is equated at all with "a hiatus"? We really, as a culture, need to rethink our discourse and perspective when it comes to stay-at-home parents. Somehow we've gotten it all upside-down and backwards. No job is more real and applicable to life than being a parent, whether you stay at home to do it or work outside your home, it makes no difference. And, that applies to parents of all kinds- those defined by birth, adoption, and plain and pure loving kindness. Being able to stay-at-home with your kids is an honor and a privilege. I know it's not right for everyone, nor is everyone able to do it physically, financially, and mentally. But, it is a personal decision we all deserve to make, free from negative assumptions and consequences. Leaving my job in the "workforce" to be a full-time stay-at-home mom humbled me. It takes serious devotion, dedication, collaboration, creativity, patience, determination, perseverance, and skill to do the very job I thought was going to be easy. And take a look at this. As I review the list of resume power words, I can easily apply every single one of them to my job accomplishments as a stay-at-home mom. Use the link and try it. You'll see. If it's results the working world needs, let's interview the kids of stay-at-home parents. They are the results that matter, and they are sure to tell it like it is. That would certainly help the gaps in my career chronology disappear. I am thankful and proud of my work as a stay-at-home mom. I stand by it. As for my personal branding statement these days, I have to be true to myself. I am a believer, a wife, a mother, a daughter, a sister, and a friend first. I am a very passionate and determined person. I am also highly motivated. It takes my conscious effort to be still. I have this drive inside that tells me there is always more to learn (which I find thrilling) and something to be done. When I set out to do something, you can be sure I am going to break it down, find some way to organize it, bring new life to it, and pour my heart and soul into it. And I should also mention, I love kindness. That's the best of me in a nutshell. There. I did it. It's a start, and we all have to start somewhere. Thank You for the tugs on my heartstrings that direct me in the ways You need me to go for You. Help me feel them and follow them. Lord, let the Holy Spirit work in me and through me. In all that I do, use me to inspire others and share Your love in the world. Lindsay - I love this, on so many levels. As you know, my blog has basically been therapy for me in my transition from working woman to stay at home mom and back again in a form I never expected. I've struggled so much with the labels and my identity, and how I see myself. It's been a huge learning process and I wouldn't trade the time I had at home with my boys for anything in the world - not for more money in the bank or nicer things, which we would surely have if I had worked!! So, I agree wholeheartedly that your time at home has value. Getting that across on a resume is so hard. Ironically, I am now in this part time position at my husband's small firm where I am in charge of hiring people. I interviewed many young candidates for a position last summer, and it was eye opening. I saw a lot of bad resumes :) While we ended up hiring someone right out of college (who is great, by the way) we have talked about how we may have a need in the future for someone like us - a mom, returning to work with that real world/mature experience that can't be replicated elsewhere. I say that just so you know that there are places out there - particularly small family businesses - where the balance between work and home life is not only valued, it is a normal part of the place. Our kids pop in and out of the office on a regular basis. Jim and I are both better workers because of that. And there is no way I'd be in the position I am now if I'd continued to work full time when I had them. I wouldn't have been available, and I probably wouldn't have been willing to step in as the office manager. But because of my time at home, I'd naturally learned many of the skills required for the job. I swore I would never work for Jim, and yet - here I am, and everyone is happy and things are going well. It's great. So, I have faith that God's nudging is the beginning of an awesome plan for you and that when the time is right you will find an employer who looks at your resume, sees the value in your experiences, and smiles.